The narwhal — thought to be a juvenile male because of its half-metre-long tusk — was filmed in July , thought to be mostly or all males. 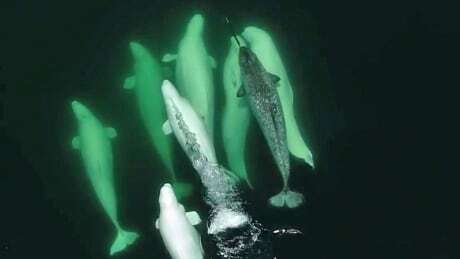 In the drone footage captured by GREMM researchers and , a pod of nine or 10 belugas swim closely together near the surface, rolling and rubbing against each other. Narwhals live in the icy waters of the Arctic, including those surrounding parts of Canada, Norway, Greenland and Russia. They typically don't range any farther south than northern Quebec's Ungavu Bay, located south of the southern tip of Baffin Island. But sightings are rare enough that there was a bit of a buzz when the researchers aboard GREMM's boat, Le Bleuvet, , among a pod of 60 to 80 belugas. described the skull of what was believed to be a narwhal-beluga hybrid, with teeth somewhat similar to both, although that was never confirmed with DNA testing.